An adventure to Florida’s Nature Coast to investigate wild freshwater springs and the animals and habitats that depend on them. 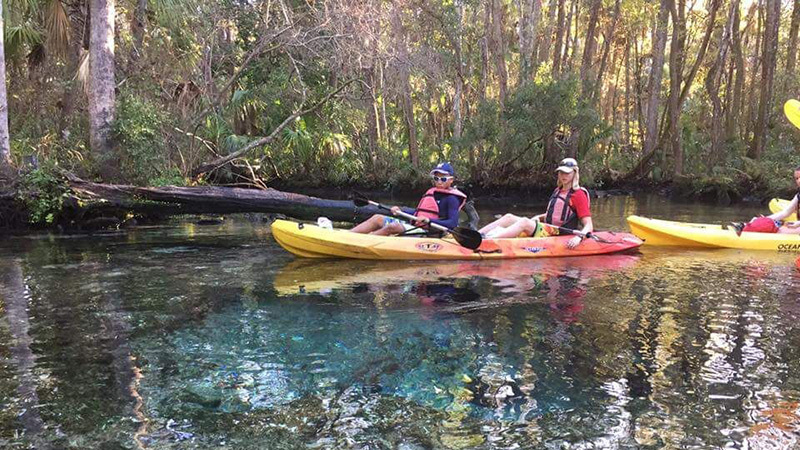 Join us for an educational science tour for students that explores wild Florida as a way to investigate the habitats that early explorers like Ponce de Leon encountered when he came to Florida looking for the Fountain of Youth in these same springs. Science students will learn about the water cycle and conservation issues affecting freshwater as it relates to the aquifers and the people and animals that depend on them. 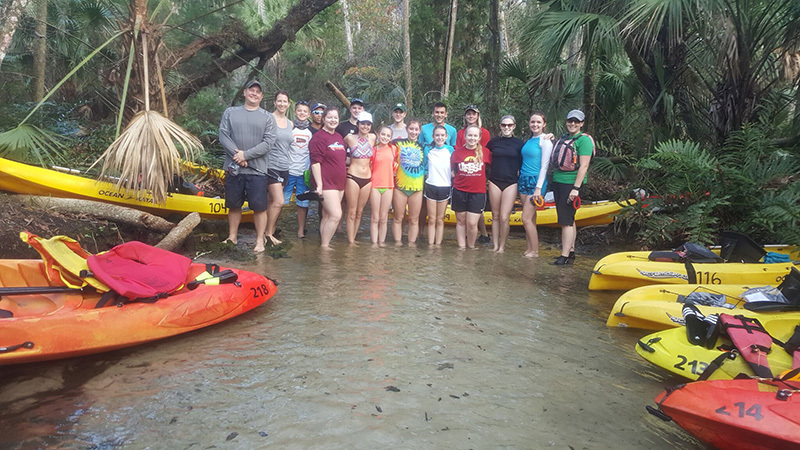 Fun outdoor adventures like kayaking, nature walks, and an in-water meet and greet with wild manatees will make this trip a life-changing experience for students. Science students will use outdoor adventure as a way to explore and discover Florida’s Nature Coast habitats and learn positive ways that they can help protect our planet’s precious water no matter where on Earth they live. 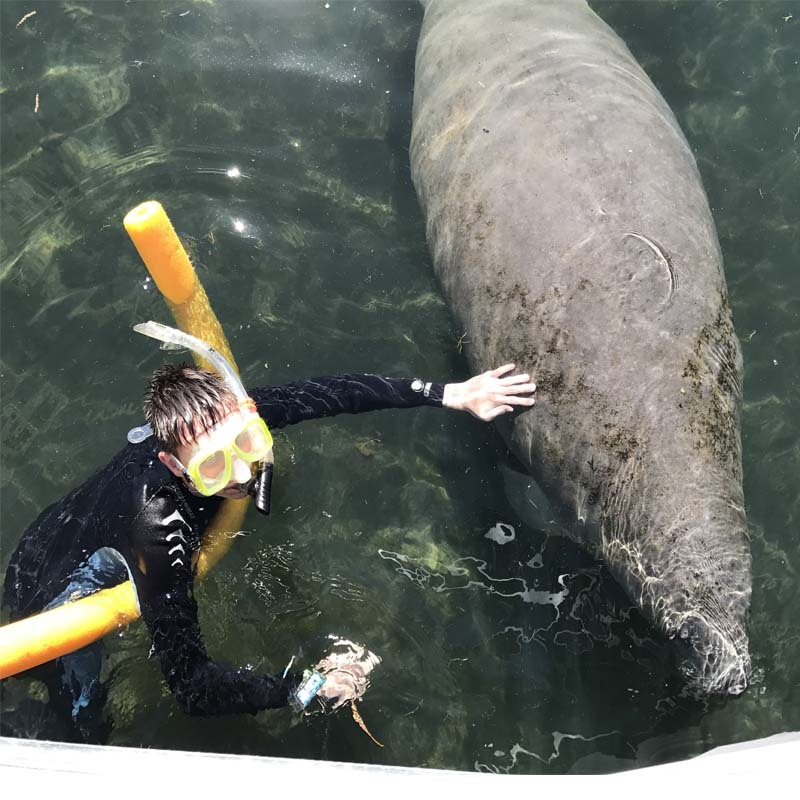 It is important to know that although the highlight of the trip will be snorkeling with manatees, the focus of the tour is spring shed ecology. Wildlife encounters with manatees we are always instructed and guided by a local permitted, licensed guide to ensure we follow all rules and regulations. Experience wild Florida along the Nature Coast. Learn about Citrus County’s amazing springs and how people and animals depend on them for survival. Go kayaking in the wild Chassahowitzka River, Florida’s Amazon. 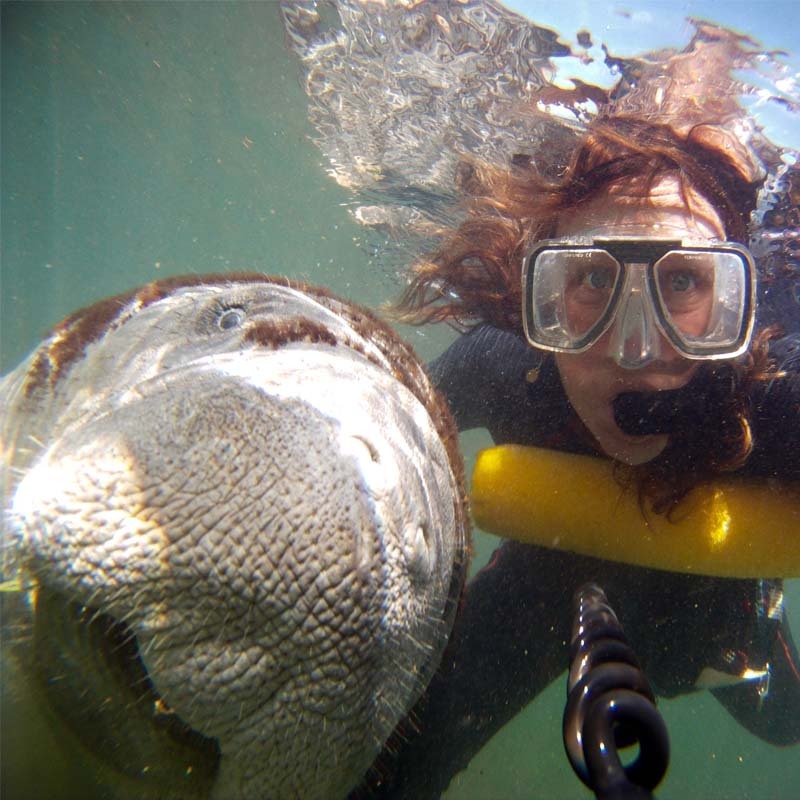 Life-changing in water guided encounters snorkeling with wild manatees. 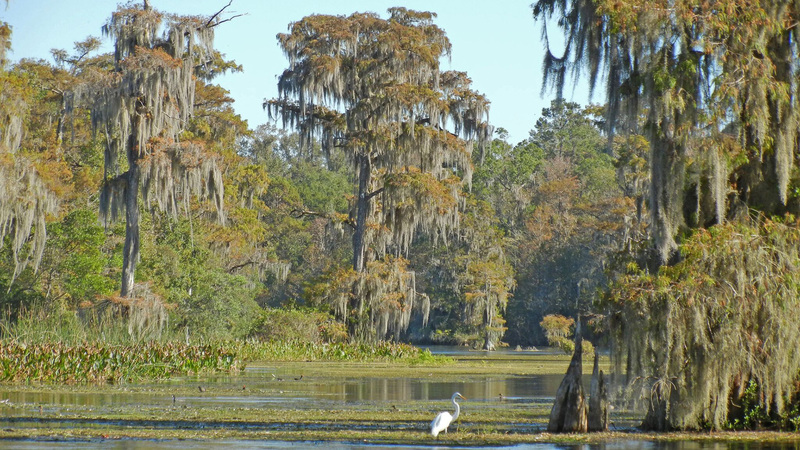 A thrilling air-boat ride over wetlands and through rivers to see wildlife not accessible by the prop boats. 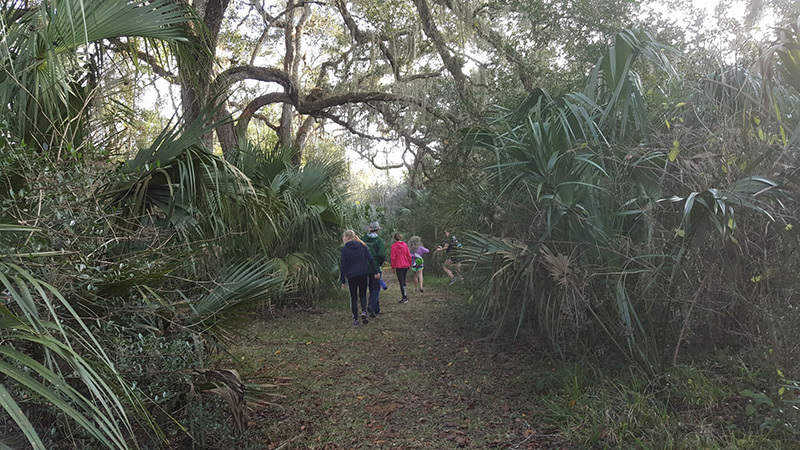 Take a walk on the wild side with naturalist-led hikes to learn about ecology of upland Hammock Forests. Plankton tows, microscopes, and habitat ID cards will get students looking more closely at the surrounding habitats. Learn ethical angling with fishing activities right out our front door. Visit to the Homosassa Springs Wildlife Park for a closer look at native Florida flora and fauna. We will live together in a charming Florida rental home and share communal duties of preparing for, making, and cleaning up after meals. The house has separate male and female bedrooms, each with 10 beds, and 2 shared bathrooms, plus one room with a queen size bed, and some additional beds tucked away if needed. There is a large living and kitchen and dining area as well as a huge swimming pool and screened in porch that overlooks Crystal River. ►Day 1: Welcome to the Sunshine State! Groups will fly into either Orlando or Tampa, Florida depending on the most economical flight options for groups. We will drive about 1.5-2 hours to the Florida’s Natural Coast. Move in. Orientation. Swimming. Dinner. Afternoon: Called by many, the Amazon of Florida, we will paddle up lazy streams meandering through breathtaking scenery on clear water. Chock full of wildlife, this is the best way to see dozens of bird species, and possibly elusive wildlife like river otters, alligators, deer, and manatees. 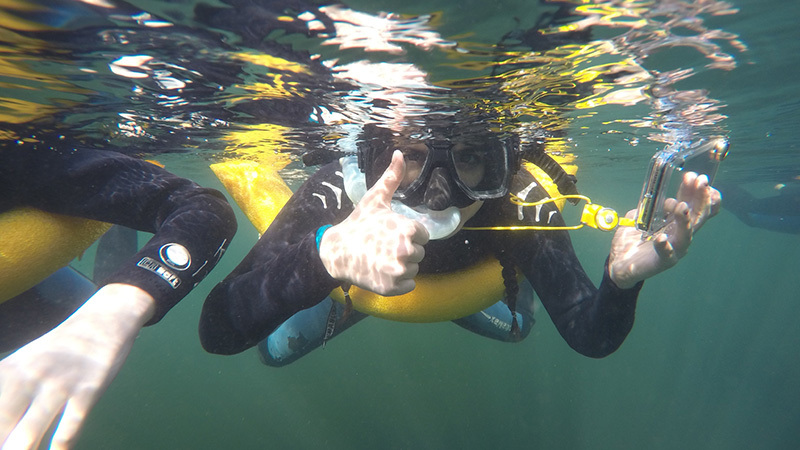 A couple of highlighted stops included snorkeling in springs like Seven Sisters or The Crack to learn about karst formations and to explore the crystal clear underwater habitats. Afternoon: Homossassa Wildlife Park. The refuge has all orphaned or injured wildlife that represent Florida (and a few other interesting residents). 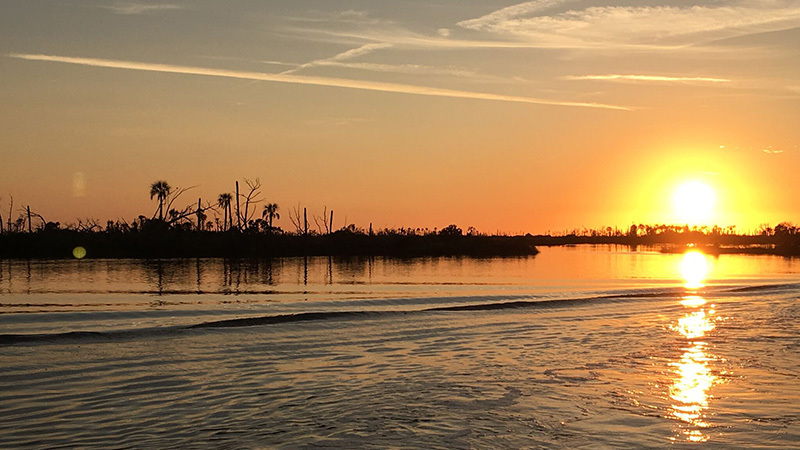 This is a perfect place to learn to identify Florida birds, reptiles, and other wildlife to help gain a better understanding of this regions ecology. Morning: It’s an early start, but well worth it. After breakfast we will head to the Homosassa River for your first encounter with manatees. 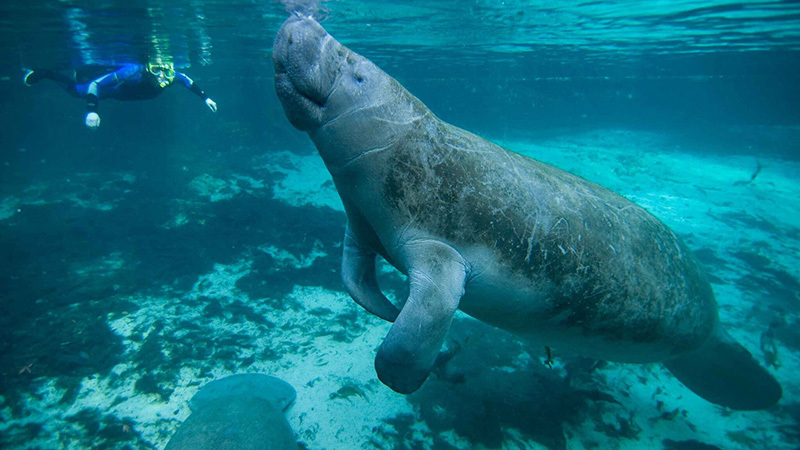 Your captain will take you out into the springs on a pontoon boat in search of manatees in the calm water of the Homosassa River. You pass by Monkey Island and see spider monkeys and learn about why monkeys are living on that island. Then the “hunt” begins. 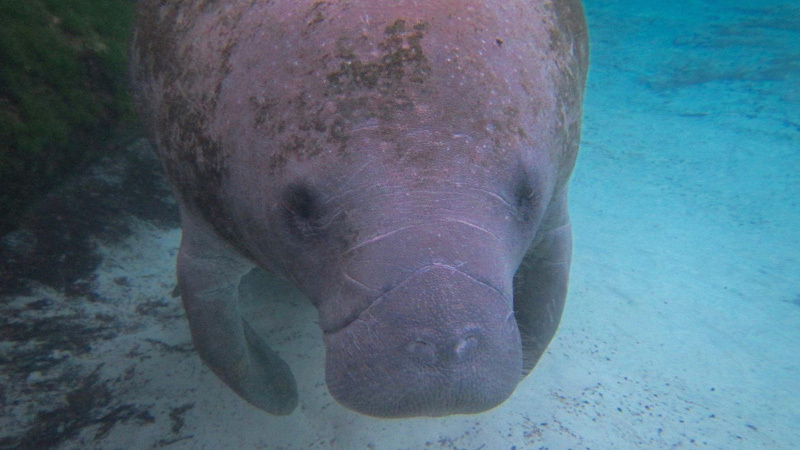 Once the manatees are spotted, your captain will anchor and everyone will get in the water with the manatees. Afternoon: Lunch is at restaurant. Shopping for souvenirs. Then a 1-2 mile walk through Hammock habitat. These areas are the uplands to springs and are home to fun Florida residents like armadillos, wild bore, raccoons, and deer. Students will use habitat ID cards to learn to identify plant communities. Your naturalist will show you wild edible plants along the way. Morning: Return to Homosassa Springs for snorkeling with Manatees because one time just isn’t enough. This time around, you will feel more comfortable and start to notice other animals like fish and turtles swimming around you. Afternoon: This is an adrenaline pumping 1 hour adventure. Let’s go topside looking for more Florida wildlife on the Withlacoochee River (or crooked river)! The Withlacoochee is a river the flows North to the Gulf of Mexico. The habitat is dominated by Cyprus Gum and Maple Trees. 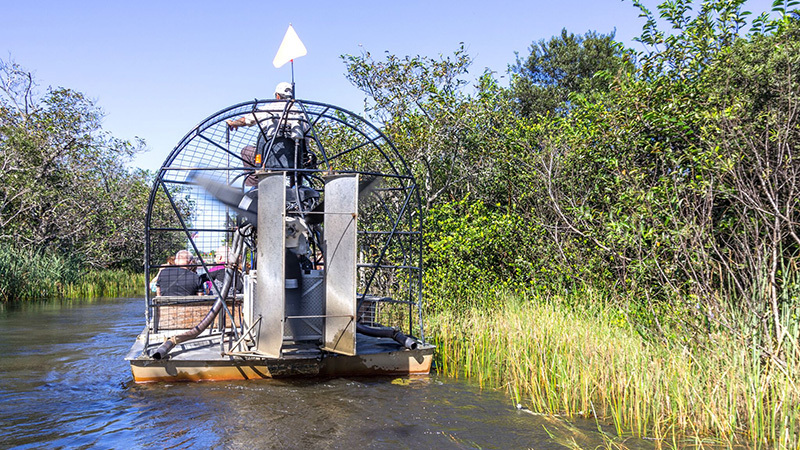 An airboat ride is a great way to access parts of the river that are too shallow for prop boats giving us access to unspoiled natural areas. 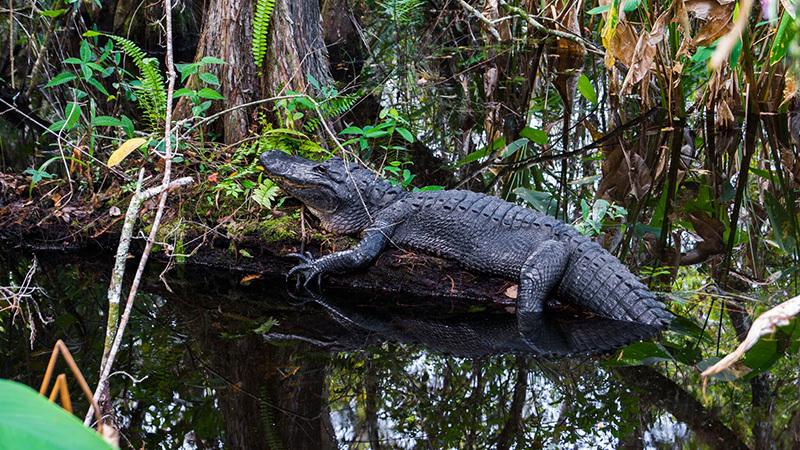 Some of the most famous residents of this river are the American Alligator, otters, turtles, deer, and wild boar. 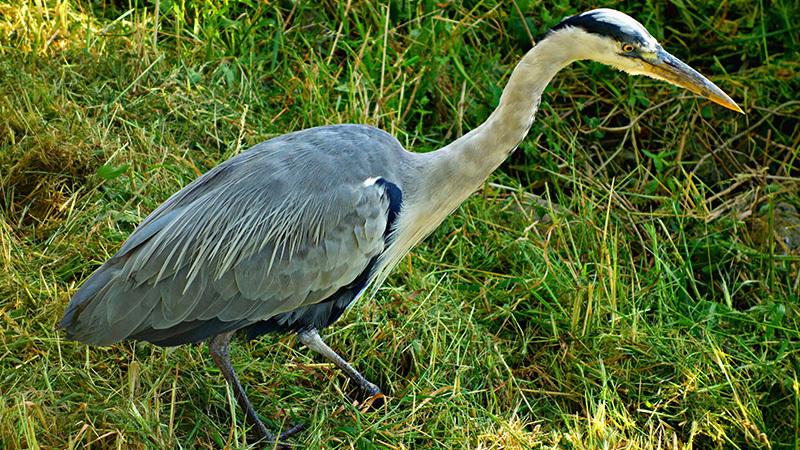 Birders will love the large variety of birds to see. – Bring your camera and binoculars! After breakfast we finalize projects and have one last educational program. If time allows, students can enjoy free time and swim in the pool before checking out of the rental house and heading back to the airport. All meals from dinner on arrival day to breakfast on departure day.